This bright green leafy vegetable is a nutrient powerhouse. Spinach is an excellent source of calcium, folate, iron, magnesium, manganese, potassium, tryptophan, and vitamins A, B2, B6, C, E and K! And spinach offers a high concentration of health promoting phytonutrients such as carotenoids and flavonoids; carotenoids and flavonoids help provide antioxidant protection. All of these combined help protect the body against bone problems, cancers, cardiovascular risks, inflammatory problems, and oxidative stress-related problems like atherosclerosis and high blood pressure. 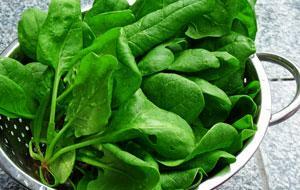 Some studies have shown that spinach may play a role in preventing eye problems like age-related macular degeneration. And the plant compounds in spinach may help keep your hair and skin healthy. When it comes to good health, spinach doesn’t mess around! Looking for new ways to enjoy spinach? Use spinach in place of basil leaves to make spinach pesto; use spinach in wraps; stuff chicken with spinach, onions and low-fat cheese; add spinach, low-fat cheese, mushrooms and onions to omelets; layer spinach in lasagna; make a simple, colorful spinach and strawberry salad; make a classic sautéed spinach and garlic side dish; or add spinach to stir-fry dishes. Spinach is a versatile vegetable and makes a healthy addition to many meals. Stay strong and eat well with spinach!